We are happy to welcome back guest author Jim Sundman. When George Dupont appeared before Lieutenant John Grimes to join Company B of the 13th New Jersey Volunteers on August 12, 1862, Grimes may have hesitated before he wrote down Dupont’s place of birth on the enlistment form. Dupont was foreign-born, which was not unusual as the 13th, like a lot of regiments during the Civil War, had many soldiers in its ranks born outside the United States. While most of these men in the 13th were from Ireland, Germany, and England, there were also some who came from Scotland, Canada, Switzerland, France, and Holland. In addition, Jacob De La Motta, a sergeant recruited in Company I was born in Jamaica, and Samuel Harman, a corporal in Company G was born in British Guiana. But on that day in the company’s recruiting office in Jersey City, Grimes may have enlisted the only soldier in the war – Union or Confederate – who was native to Siam, or modern-day Thailand. Though George Dupont is fairly well-known in New Jersey Civil War circles, he may be lesser known outside the state. Dupont came to America just two years prior to the start of the war, sailing into the port of New York in 1859. He was living in a boarding house at 222 York Street in Jersey City when he joined the 13th New Jersey that summer day. His occupation was a “type founder”. He listed his age at 18, but because he may have looked younger, a guardian named William J. Hagen signed a “consent in case of minor” form. In addition to a $13 advance to his monthly pay as a private for enlisting, Dupont also received a $25 State bounty and an additional $50 from the Jersey City Bounty Fund. Why Dupont came to America is unknown. He can’t be found in the 1860 census, nor is he listed on any immigration lists or ship passenger manifests just prior to the Civil War. These records may indicate who he was living with soon after arriving or who (if anyone) he traveled with from Siam. Later documents show that he appears to be educated, and it is possible that he could have been schooled by American missionaries and sent to America, or perhaps returned to the States with them. He did not use the name “Dupont” an alias either to join the 13th. Though it may not have been his original name in Siam, George Dupont is listed in the 1861-62 Jersey City Directory. During the war, Dupont was with the 13th New Jersey at Antietam, Chancellorsville, and Gettysburg, and appears to have gone through all three battles unscathed. However, after Gettysburg he became ill and was in a hospital near Alexandria, Virginia during the late summer and early fall of 1863. At the Battle of Resaca the following May, Dupont was wounded slightly but did not require hospitalization. But a month later he was wounded severely in combat when the 13th was engaged in the Battle of Kolb’s Farm on June 22, 1864. He recuperated over the next year and was discharged at Louisville, Kentucky on June 26, 1865. Upon leaving the army he received a $75 federal government bounty for finishing his military service as well as back pay and traveling expenses to New Jersey. On August 2, 1869 Dupont was naturalized as an American citizen in Philadelphia, and a week later issued a passport. He left the United States soon after and arrived in Bangkok sometime in 1870. 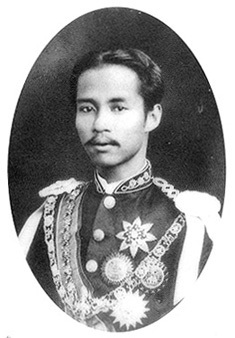 Dupont’s return to his native country may have been influenced by the appointment of King Rama V, one of the most revered monarchs in the country’s history whose lengthy reign (1868-1910) was known for its modernization and reforms. 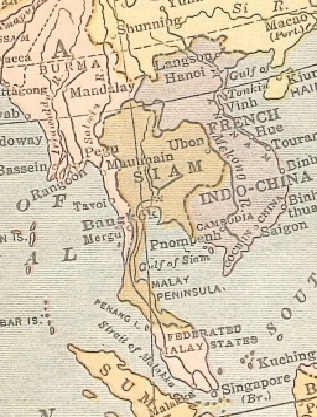 Upon his return to Siam, Dupont went to work for the Siam Weekly Advertiser, an English language newspaper in Bangkok published “to keep those interested in the country fully acquainted with events transpiring in it.” He wasn’t at the paper long before the Siamese government recognized Dupont as a “young man well up in military affairs” and employed him as a drill master for the Siamese army, paying him $50 a month for his services. After his work with the military he eventually became a timber dealer which enabled him to travel throughout Siam, including by boat up and down the country’s rivers. Dupont was asleep on his boat while it was moored on the Yom River at the town of Mueang Sawankhalok in central Siam early one morning in November 1889 when he “was attacked by thieves and desperadoes.” Though “only a fortunate change in position on my part [saved] me from instant death,” he said, Dupont still ended up being somehow shot through both feet. The incident even drew the attention of an American newspaper calling the act “an outrage upon…an American citizen, residing in Bangkok, Siam committed on his person by subjects of the King of Siam.” In April 1891, because he was unable to work due to his injuries, Dupont applied for a military pension through the American Consular General in Bangkok under the Pension Act of 1890 which allowed for Union Army veterans to receive a pension even though their disability was unrelated to their Civil War service. Though Dupont claimed that his “left foot is wholly useless and the right one is nearly so…preventing me from engagement in any active business,” the Pension Office in Washington still required a “careful examination of this soldier.” In February, 1892 Dupont was checked by a physician in Bangkok to verify the extent of his injuries. Once completed, he was approved for a $12 per month pension. However, Dupont’s pension payments were later at risk of being suspended as a result of the Pension Act of 1893 in which non-citizens were not allowed to collect unless their disabilities were incurred during military service. Since Dupont’s injuries were not war-related, he had to provide a copy of both his naturalization and passport documents showing he was an American citizen. To do this, he neatly wrote copies of both, showing the originals to the United States Consular General in Bangkok who “legally verified and viewed” the copies. The copies were then sent to Washington in order for his pension payments to continue. One can only imagine the length of time correspondence took between Southeast Asia and the United States in order to settle these matters. Dupont married for the first time in early 1900. The marriage however was short-lived. George Dupont died of heart disease on July 18, 1900. He is buried in grave 720 in the Bangkok Protestant Cemetery. What remains a mystery is whether Dupont was an ethnic Asian. Letters, diaries, and books written by members of the 13th New Jersey make no mention of a Siamese national in their ranks. In addition, when he worked for the government training Siamese soldiers, Dupont was described as a “foreign instructor.” On the other hand, it is noted elsewhere that he was raised in Siam and that the “Siamese language is the language of Mr. Dupont’s childhood.” Also, the physical characteristics listed on both his enlistment form (1862) and passport (1869) concur, and are descriptive of an ethnic Asian: black hair, black eyes, dark complexion, and oval face. Lastly, one historian noted that Dupont’s original Siamese name may have been “Yod” but this remains uncertain. It is even possible he could have been mixed race, but unless a photograph or other documentation surfaces, it may never be known what his true ethnicity was. Records in the Thailand National Archives may hold more clues. George Dupont is not the only veteran of the 13th New Jersey who is buried outside the United States. William Van Syckel, a private in Company B, died in 1914 in Havana, Cuba; and Henry Guyer, Captain of Company D died in Lima, Peru in 1907 while working as the head of a mining company. But of the hundreds of thousands of foreign soldiers who fought in the Civil War, Dupont may have fought furthest from his native home, and he may also be buried furthest from the fields he fought on. Dupont, George. Company B, 13th New Jersey Volunteers. Pension Records. National Archives Washington, DC. Dupont, George. Company B, 13th New Jersey Volunteers. Military Service Records. National Archives Washington, DC. Journal of the Siam Society, Volume 64, Part 1. January 1976. Philadelphia Inquirer, May 1 1866. Phongphiphat, Wimon and Phongphiphat Napha. 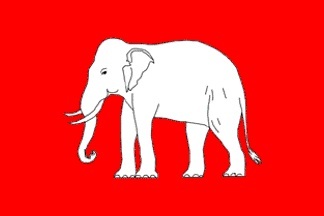 The Eagle and the Elephant: Thai-American Relations Since 1833. Bangkok, Thailand: United Productions, 1987. San Francisco Chronicle, October 27, 1890. Smith, Samuel J, Ed. The Siam Repository. Volume 2. Bangkok, 1870. This entry was posted in Common Soldier and tagged 13th New Jersey, Antietam, Battle of Kolb's Farm, Chancellorsville, Resaca. Bookmark the permalink. Great article. Nearly one-in-four Union soldiers was an immigrant. They didn’t just help free the slaves, they created modern, multicultural, America. “Na Sonjai”– very interesting. Live in Chiang Mai with many expats who are veterans of the Vietnam War.